More power. It’s not just the Tool Man that’s looking to tweak and tinker in order to achieve that goal. Some do it with fewer explosions (and a lot less grunting). Admit it, when you get a new gadget that you love, a voice in your head will, without fail, say something along the line of “Yeah…it’s cool..but…I wish I could…(insert awesome tweak idea here)!” Don’t fight it, it will happen without fail. Some choose to ignore it, others strive to attain it. Want an example? Try checking out BlackBerry App World or the CrackBerry App Store- they’re called applications. Take the SixTools application for example. Recognizing what is available in OS 6 it adds “what if” and “how about” through shortcuts, alerts, sounds and more. 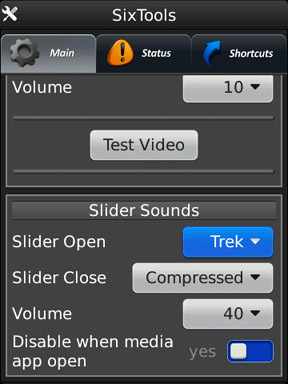 Those who weren’t completely satisfied with what OS 6 offers, should take a look at the functionality this application provides. I’d suggest you put down the welding gun or duct tape and have a read on. 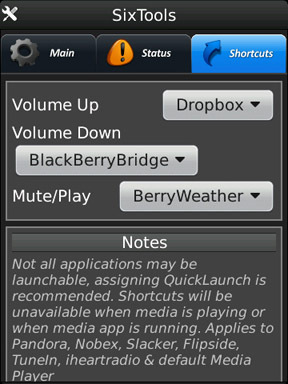 The main menu houses 3 different sections from which you can enhance your BlackBerry to your liking. Main - In this section users can access options such as sounds, alerts, behavioural changes and notifications. Remember the BlackBerry startup video you watched oh so long ago? You can have it play every time you start-up. You can also associate sound notifications when your device goes into (or out of) your holster – with the Torch you can also assign sounds to when you slide it open or closed. Also on your Torch you can auto-lock home screen in portrait mode, as well as add the lock option to menus. SixTools provides an additional battery meter that displays a charge percentage beside the icon. It has a Precision view or Classic view available. You can choose to have it display all of the time or when it reaches a certain percentage. Additionally you can use a low battery alert that will make your BlackBerry sound an alarm (found in your profiles) and make your LED indicator a specific colour. 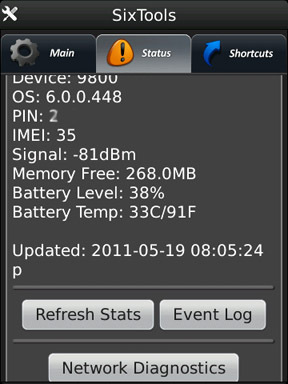 Lastly, you can manage the behaviour of your BlackBerry when connected via USB or docked in a cradle – you can dismiss the USB pop-up after 5 seconds and unlock portrait when docked. I never pay attention to the USB Pop-up, so I’m glad to see it disappear. Status - Here you have access to the stats you need..and some you don’t (but say you have it anyway). By default, you will see standard info such as OS version, PIN, IMEI, signal strength, free device memory, battery level and battery temperature (both Celsius and Fahrenheit). In this section, you have access to the event log (no more pressing ALT+ LGLG for you). Network Diagnostics lets you see items such as Radio Access, Server names and verifies BlackBerry registration, ICMP Ping Echo and more. Each time you access Network Diagnostics, it re-registers your BlackBerry with your wireless network. Shortcuts - Yes! You know I’m all about shortcuts. I know I said it many, many times, but I miss having two convenience keys. What SixTools does is transform your volume keys, and mute/play key, into extra convenience keys! They can handle both native and third party applications. Of course, if you are accessing media or media apps, the shortcut functions will not work. You can count on ShaoSoft to make sure your BlackBerry has all the right moves. This unique application does well with adding shortcuts and alerts. The only problem I saw was the startup video didn’t always play. I would sometimes only see a split second darkening of the screen upon startup. If you want to check out SixTools, it’s available for $3.99 (currently on sale for only $2.99) from the CrackBerry App Store.